On July 29, armed masked men kidnapped Sergey Nikolaevich Filindash, secretary of the Communist Party of Ukraine in Volnovakha, 60 km south of Donetsk. This is a new example of the campaign against the democratic rights of left wing militants and their organisations in Ukraine at the hands of the Kiev authorities and the fascist gangs they employ. Basically, Filindash was accused by Turchynov of “activities to the detriment of national interests of Ukraine” and of “providing logistic and practical support to the terrorists”, but all that is said about him is that he led a protest by 40 unarmed people. It is ominous that after being denounced by name in this report, he has now been kidnapped by armed masked men as soon as the forces of the “anti terrorist operation” have taken back control of the town. Just a few days ago, the Communist Party organisation secretary in the village of Glinki, was also kidnapped at a National Guard check point and then appeared, dead and tortured, the following day. Masked militants kidnapped from his home tonight the first secretary of the district committee of the Communist Party in Volnovakha, Sergey Filindash. In his home in Volnovakha, bandits broke in without a warrant, captured him in front of his wife and children and took him to an unknown destination. It is obvious that today the authorities under the guise of the ATO commit terror and violence against dissidents. This is not the first attack on the communists in the last days in the Donetsk region. Recall that on the night of July 22, the primary party organization secretary of the Communist Party in a. Glinka, the deputy village council Starobeshevo District, in the Donetsk region, Vyacheslav Kovshun, born in 1956, was killed at a checkpoint of the National Guard near Luzhki. In the Velikonovoselkovsky area, Kolomoyski’s nationalists attacked the District Committee of the Communist Party and the offices of the Communist deputies. Despite all the talk about the “state of law” and “European values”, in the Donbass serious crimes are being committed, the list of which is multiplying day by day. 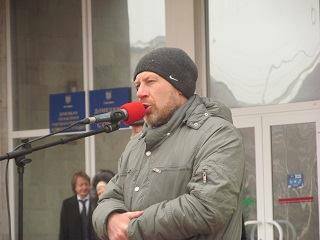 The Donetsk regional committee of the Communist Party demands an end to lawlessness, the release our comrade, the father of three children, who is not a criminal nor a “militant” unlike those who attacked him. This entry was posted in News, Solidarity and tagged ATO, Communist Party, Donetsk, KPU, Volnovakha. Bookmark the permalink.